Native of Western Australia, South Australia, Victoria, Tasmania and New South Wales. 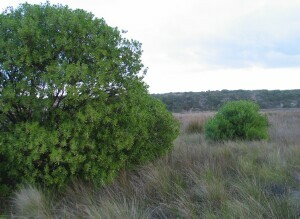 A small spreading tree to 6 m tall with tessellated (with coarse fissures) bark and smooth branches. 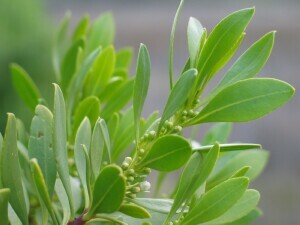 The smooth leaves are lanceolate (spear-shaped) to broad-elliptic, 3-9 cm long and 7-22 mm wide with smooth margins or toothed towards the pointed apices. 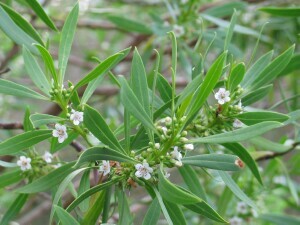 Flowers in groups of 3-8 in the junctions between stem and leaf and with short stalks 5-9 mm long. Flowers white and purple spots and 6-8 mm diameter. The round fruit are 4.5-9.5 mm diameter, smooth and purple to black in colour. 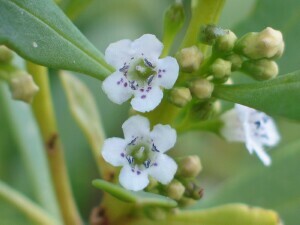 Common in coastal scrub and along the edges of coastal saltmarsh.